JCK Magazine recently released their ”Top 12 Jewelry trends for 2012”. CL picked our top 4 favorites. Check them out here. 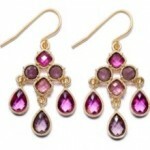 Small chandelier earrings- Dainty versions of these enchanting earrings will be seen everywhere. Engagement 101 TV was at all the hottest events at this year’s Jewelry Fashion Week in Las Vegas. In this video we chat with the winners of the Platinum Innovation Awards and then mingle with celebs on the red carpet of Simon G’s Summer Soiree event. sfestilo.com has put together the top jewelry trends for 2012 straight from the runways and top fashion magazines.